Clannad is a very special visual novel for a lot of people and with its recent Kickstarter campaign it became the first visual novel to crowdfund over $500,000, so you can tell it has a substantial following in the West. Originally released in 2004, it is often referred to as a classic and for once I have no trouble seeing why so many people adore it; with the incredibly poignant emotion it offers it would be hard to deny its ability to forge a connection with its readers. However, today I am here to tell you that although I can understand Clannad’s fanbase, I do not count myself among them. I’ve been provided with a very helpful media package this time around, so here’s the official synopsis! To get it out of the way I need to admit that this is my second play-through of Clannad, though that doesn’t mean a great deal because my opinion this time around is exactly the same. I’ll start out with the positives, because I need to acknowledge the fact that Key actually did a fairly decent job here (especially compared to more recent releases like Rewrite). The emotion I mentioned earlier is definitely there and, at certain points of the story, in spades. Even at times I felt disconnected with the narrative as a whole I found myself tearing up at the situations faced by the characters and as often as not it was positive emotion rather than sadness. You don’t get a lot of VNs that can make you happy in the same way that Clannad does. There are emotional gut-punches, too, so you’re covered no matter which end of the scale you prefer. Key also does a fantastic job of showing you how and why each character affects one another’s development over the course of the novel and that can make for some very interesting reading, partly because the writing style makes it easy to get inside each character’s head and feel what they’re feeling. Unfortunately, there’s a “but” that comes after that paragraph. Those emotional moments are Clannad’s aim right from the get-go and the problem it faces is keeping its audience entertained while it gets its pieces into place, meaning that your enjoyment of it will be directly proportional to how much you are entertained by its slice of life and comedy segments. While I was pleasantly surprised by some of the humor I encountered the sheer volume of time that can pass with nothing at all happening is staggering. Unfortunately, to top it all off, while the highs and lows are great while they last they are also incredibly short lived. Without putting together an actual graph to illustrate my point, I hope you can appreciate that the time you have to put into Clannad to get anywhere significant really doesn’t match up with what you stand to get out of it unless, as I’ve said, you enjoy the fluff it’s stuffed full of. It’s worth noting here that the second half of the VN, known as After Story, is significantly better than the first, though it still suffers from the same problems at points. To get to After Story, however, you need to sit through each and every one of the preceding ten routes. That might not sound too bad, but believe me, the fluff builds up. Even during my first playthrough I was struck by the overwhelming desire to skip entire storylines because the ratio of entertaining content to filler is just that skewed. 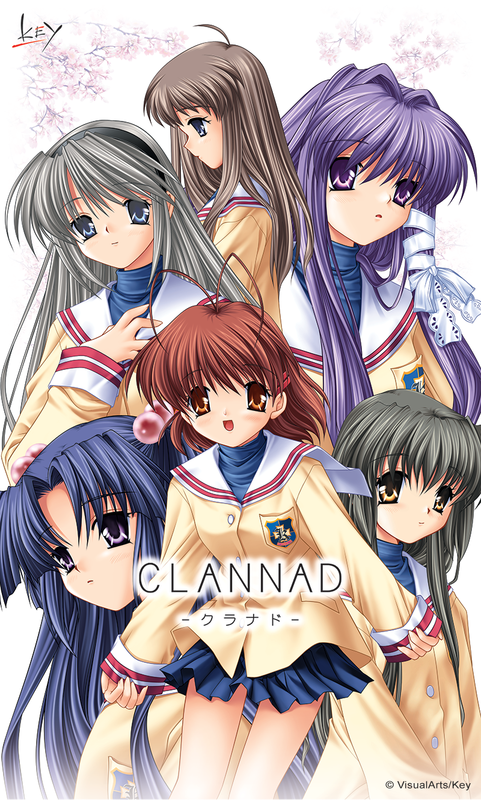 Clannad’s art has not aged well, even when compared to other visual novels of the time. 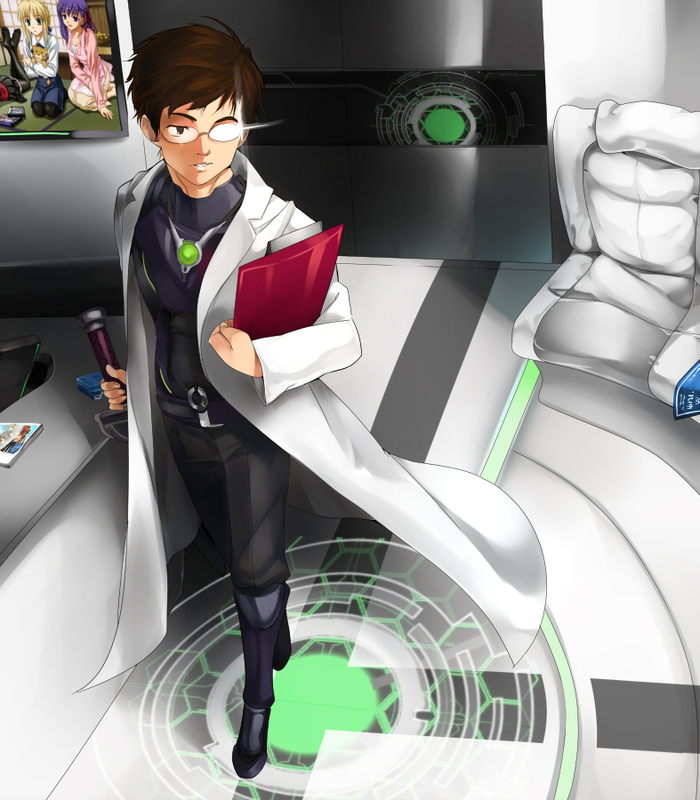 While the backgrounds are fine its characters look unnatural and it boasts a relatively low count of CGs for its length. You could argue that the art style is part of the visual novel’s overall charm, though I’d be inclined to disagree with you. That all said, the expressions on the sprites do a good job of conveying character emotions and even manage to succeed in fostering some “HNNG” moments of cuteness overload (yeah, don’t see me saying that very often). Key fans will enjoy the nostalgia granted by the soundtrack but as far as I’m concerned it simply does its job alongside the usual-quality voice acting. Sekai Project has added a neat feature in the form of the Dangopedia, a resource that aims to fill readers in on aspects of culture that might otherwise elude them. There are some interesting entries that I would never have picked up on myself but others don’t really go far enough to explain why a particular reference might be considered comedic in the novel. There are minor typos scattered throughout and I spotted at least one mistranslation, but in general Sekai Project has done a great job of bringing Clannad to the West in an official capacity. Summary – I understand completely why some readers look back on Clannad with extreme fondness. It reaches some emotional highs and lows with relatable characters that could make it easy to connect with the events it portrays. However, the narrative, like the art, is outdated, taking extended periods of time to set up for the climaxes it aims for and featuring large swathes of content that are unnecessary and tedious to read. For me personally, that’s a deal-breaker and I doubt that I will ever pick Clannad up for a third read or recommend it to anyone. If the slice of life and comedy are your kind of thing then you’ll have a great time (or a terribly depressing one, depending on how you view it). 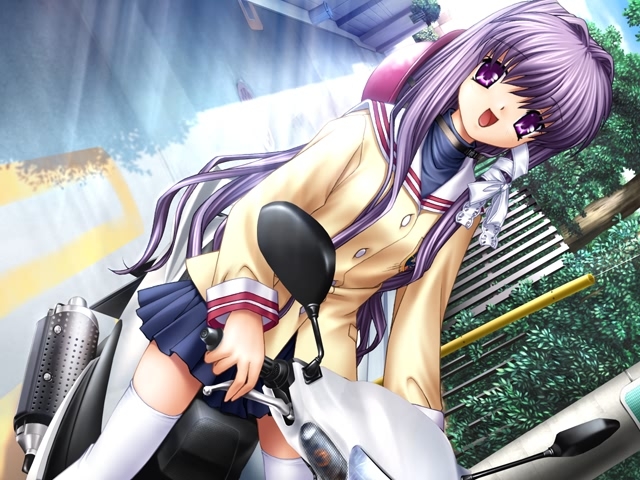 This entry was posted in Reviews, Visual Novel Reviews and tagged Clannad, Key, Review, Visual Novel, VN. Bookmark the permalink. Clannad is probably is my favourite visual novel that Maeda Jun worked on. But like you mentioned, there are lots of extra stuff that doesn’t help with the overall experience. For me personally I really liked some of the routes, but there was also a number of routes which I didn’t care for at all. I wouldn’t use it as a general recommendation either, and it really doesn’t help that its practically impossible to complete without a walkthrough. But I did really enjoy it when I read it. I probably should re-read it to have a second opinion, especially since the old fan translation was quite bad tbh, but I likely never will because I just have better things on my priorities list. And then there’s the anime, which is honestly great. It managed to blow the visual novel out of the water. Sure, it cut out some pretty cool stuff, and admittedly I think having read the visual novel already really boosts the enjoyment of it, but Kyoani really did a good job on it imo. There are most definitely parts of the novel I enjoyed; Key did a great job of getting all of their ducks in a row to produce some fantastic scenes. It’s the stuff before those scenes that made the novel as a whole hard to enjoy. After Story is a lot of fun to read, improving upon the formula used earlier but the fact that you need to go through every other route mitigates that positive aspect. I was able to overlook some of Muv Luv Extra’s dullness because there was no enforced playing order. I have yet to watch the anime though I probably will get around to it in the future because a compressed version of the VN would be great and I could see an anime succeeding in doing that. 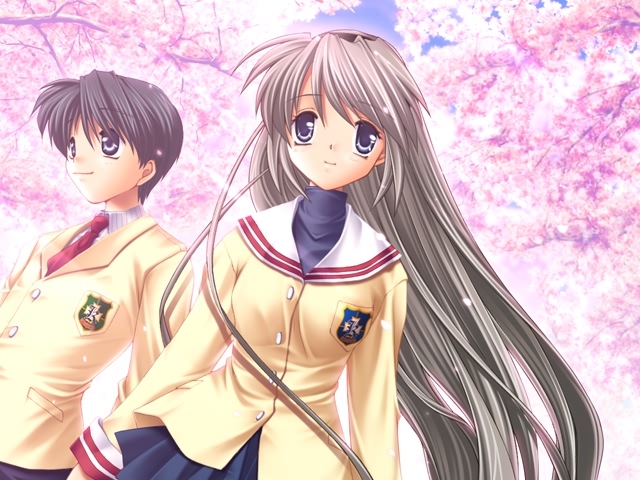 Have you played Tomoyo After? I remember enjoying it more than Clannad the first time around. It took two tries to finish though because the first 45 minutes are almost exclusively H-scenes! 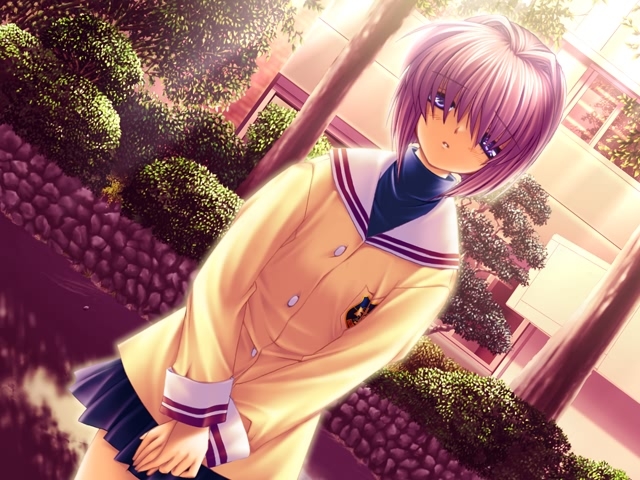 I didn’t mind the common route in Clannad (I think), but that is possibly because I really liked the main character. But then that may have been because I hadn’t read many visual novels at the time, so I’m not sure what I would think if I were to read it again. I completely understand what you are saying though, and I suspect I would have a similar opinion on a second playthrough. As for Muv Luv Extra, I certainly had some problems with it, but somehow the comedy worked for me, so I don’t think I disliked it as much as other people did. For finding your way through visual novels without a guide. For Clannad specifically it really doesn’t help that some of the choices make literally no sense for what the reader expects to happen by choosing them. At least with most other visual novels you can at least have a good idea of what might happen in the near future after making a decision. 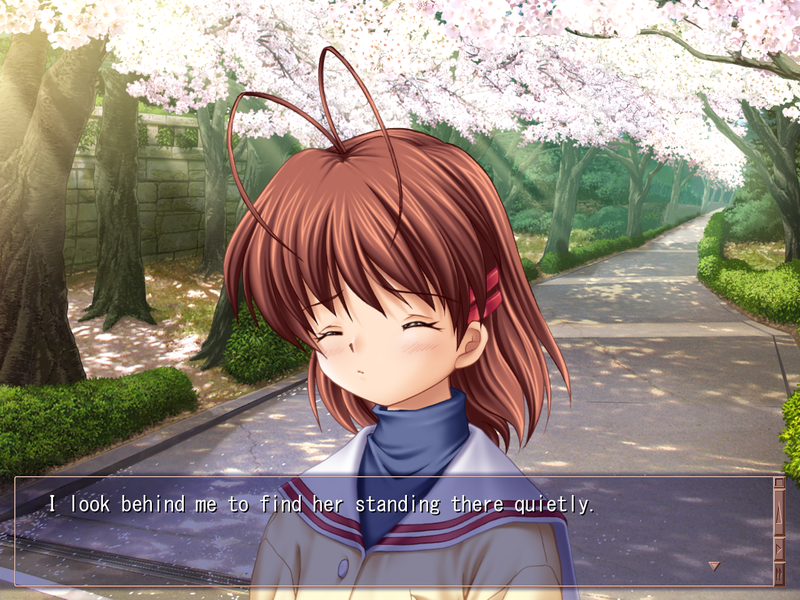 Also if you hadn’t heard already, Tomoyo After had an official steam translation announced. I’ll be re-reading it most likely when that is released because apparently the all-ages version has a different storyline and more text overall so I’m interested in how different it is. I also liked parts of the common route, mainly where Okazaki was interacting with Nagisa. Because, to begin with, the pacing of their relationship and the changes they catalyzed in one another was spot-on. Yeah, i'd be interested in playing the localization of Tomoyo After (which I hadn't seen the announcement for, so thanks for that =) ). It's one example where the adult content adds nothing whatsoever to the story, so i'm not worried about it being taken out. I wouldn’t be surprised if there were a few typos considering how long this is. I’ve seen a few voting polls saying your better off watching the anime than reading the VN. Yeah, Clannad is definitely up there in terms of VN length. I’ve seen the same, so i’ll probably pick it up at some point. Yeah, I knew that would be an issue, I seen quite a few similar criticisms on it, especially for those of us who read the VN long after it’s released. I originally wanted to play it just to try out the other routes (don’t really care for the True End) but I just keep having other priorities, lol. At this point, my interest in it had kinda waned. It seems to be a pretty common complaint. The first time around I was relatively new to the medium and it was still an issue, so I can see why so many people pick up on it. I don’t think you’re missing out on all that much to be honest; with the number of visual novels you’ve played I would be surprised if you hadn’t seen the same sorts of things done before.